Take me to a Mexican restaurant and 90% of the time, I will order enchiladas. Ground beef or carnitas are my fillings of choice. At home, I use a ground turkey filling seasoned with cumin and chili powder, always. This alone should disqualify me from being classified as a foodie–with certain foods, I am most definitely a creature of habit. For a change, I embraced spontaneity this week. My refrigerator is bursting with extra ingredients from this past weekend’s brunch and I had a strong craving for Mexican food. Instead of my usual ground turkey, I made a filling out of leftover roast chicken, spinach, mushrooms and Anaheim peppers. I sautéed them quickly and seasoned the mixture with ground cumin and chili powder. A sampling of my filling proved promising. To finish the dish, I made my own corn tortillas (recipe here) hoping that this would offset the fact that I still use store-bought enchilada sauce. I know. I have found a few prospects though–who knew there were so many variations? I even found one that uses cocoa powder (not a molé sauce)–intriguing, but next time. What I was inspired to make instead was a condiment to help brighten the flavors of the enchiladas. The darling author of The Baking Barrister arrived for brunch last weekend with a precious gift in the form of three gorgeous avocados, perfect for my Mexican-themed meal. I’ve been wanting to expand my avocado horizons by making a dressing or a sauce showcasing their smooth, buttery flavor. The enchiladas would be an appropriate backdrop, I thought. Ultimately, I made a sauce fashioned out of some traditional guacamole ingredients, puréeing the avocados with lime juice, cilantro, sour cream and salt. It was simple but it did the trick. Just a dollop added a welcome flash of freshness to the baked enchiladas. And the enchiladas themselves? Loved them! The sauce-drenched tortillas were fall-apart soft after baking in the oven, the boldness of the red sauce offering a balance against the delicate quality of the spinach and mushrooms. In fact, this combination is forcing me to rethink my old ideas about my standby recipe; I may eliminate the meat altogether next time. And finally, I even used marinated buffalo mozzarella in the filling with good results. I may have just found my new go-to enchilada. 2. Heat up your enchilada sauce in a saucepan. 3. To prepare the filling, heat a tablespoon or two of olive oil in a large sauté pan over med-high heat. Add the onions and mushrooms and sauté for about three minutes. Season with salt, to taste. Add the Anaheim chile then the diced chicken. Add the chili powder and ground cumin. Just cook long enough to heat the chicken through. Then add the spinach. It will take a minute or two for them to wilt. You don’t want to overcook this. The goal is to blend the flavors and eliminate the raw crunch of the vegetables and to wilt the spinach. 4. To assemble: Ladle a thin layer of sauce on a casserole dish. Dip the tortillas in the warm enchilada sauce and spoon on some filling and a bit of cheese. Be careful not to overfill or the tortillas will be difficult to roll. It is also best to lay the tortillas on the casserole dish you plan to use when you fill them. 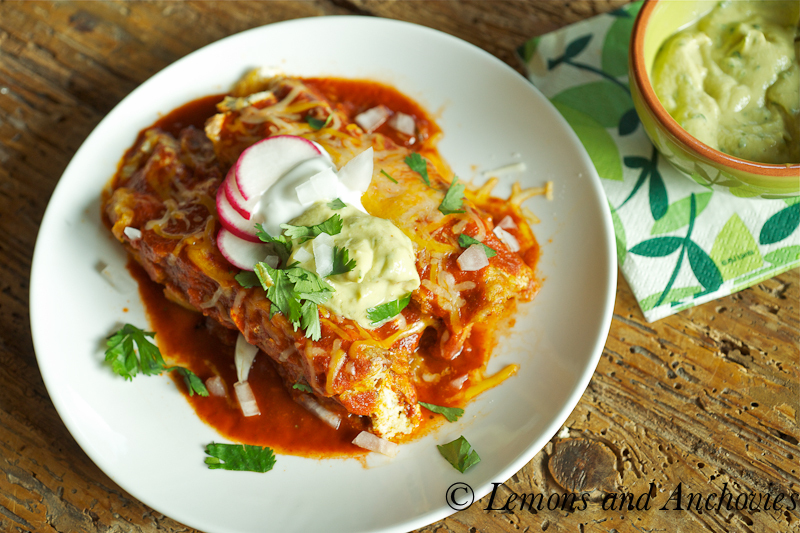 Arrange the each rolled enchilada and repeat until the dish is full. Ladle more sauce on the enchiladas, as much or as little as you like. Then top with more cheese. 5. Bake in the oven for about 30 minutes or until the cheese has melted and is a light golden brown. 6. Garnish with your favorite toppings. Purée all the ingredients together until smooth. What a lovely and exciting dish! I love the addition of spinach. I can’t blame you for wanting to eat the avocado sauce on its own. It looks so creamy. The enchiladas look delicious! And the avocado lime sauce divine! Beautiful photos! I love the sauce! It is very similar to something I made not too long ago. It looks delicious! Oh man, these look so cheesy and delicious. Love these! I don’t know what I love more, the enchiladas or the avocado-lime sauce. Obviously, I’ll just have to make both and stuff myself silly! Everything about this sounds awesome! Love the fact that you made your own corn tortillas — need to give that a shot. A few weeks ago I made my own enchilada sauce following (sort of) the recipe from last month’s Saveur. It was very unique. It had mexican chocolate in it which definitely gave it a deep, smoky robust flavor. Will need to tweak some things for next time, but it sure is exciting making different things from scratch! 🙂 Looks great, Jean! This looks amazing! I love Mexican food, and make it often. I have yet to make my own tortillas, but it is on my list of must do’s! 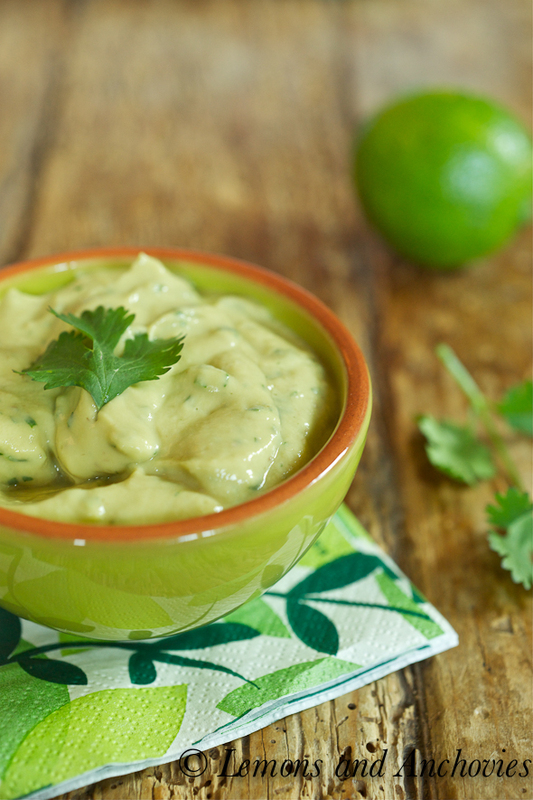 This avocado lime sauce sounds perfectly cool and refreshing to top it off! Everything looks perfect here. Yes, I DO want to sink my fingers into the sauce! I would have loved to have joined you and Stephanie for lunch! I love enchiladas too, but only if they are homemade; I find the ones at most Tex-Mex joints to be too greasy for my taste. Yours are perfect and I love that avocado sauce you made with them. 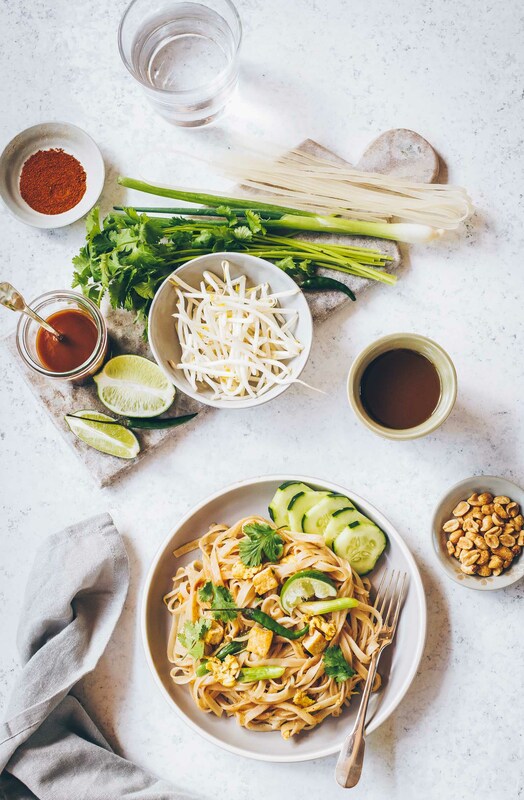 A recipe to try real soon! Whoa… you made your own corn tortilla! 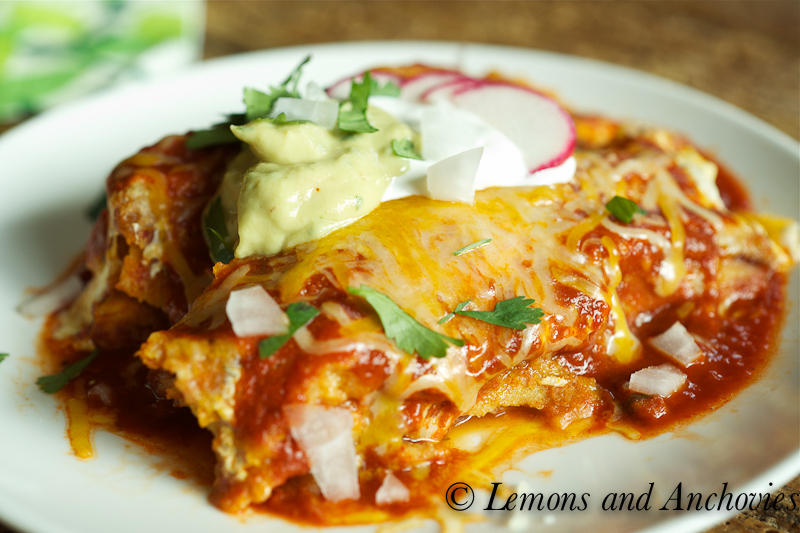 Your enchiladas look sooooooo good! 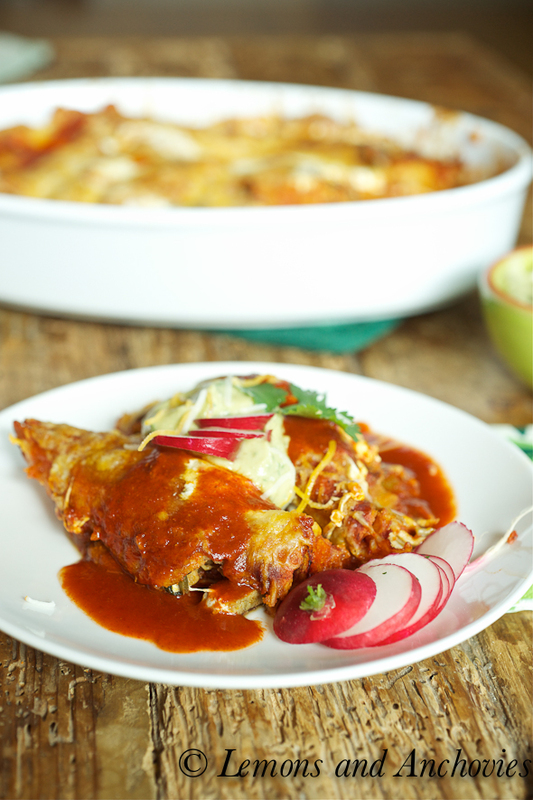 I have to admit I’ve never cooked Enchiladas at home… this looks so delicious. You always know how to make a nice plate using all kinds of colors. I just went to Hola’s (Do you know this place in Belmont?) but I should have ordered Enchiladas. I’m now craving for it! This looks amazing, Jean, and are just what I”m craving on a gloomy day like today. Hope you’re staying dry! These look great – I also have an overflowing fridge right now and these seem like the perfect solution! I love Mexican food. This looks so wonderful and I love the addition of the spinach. I can’t wait to try your avocado lime sauce. Yum! We are having enchiladas tonight for dinner. I want to try that avocado lime sauce for sure!! 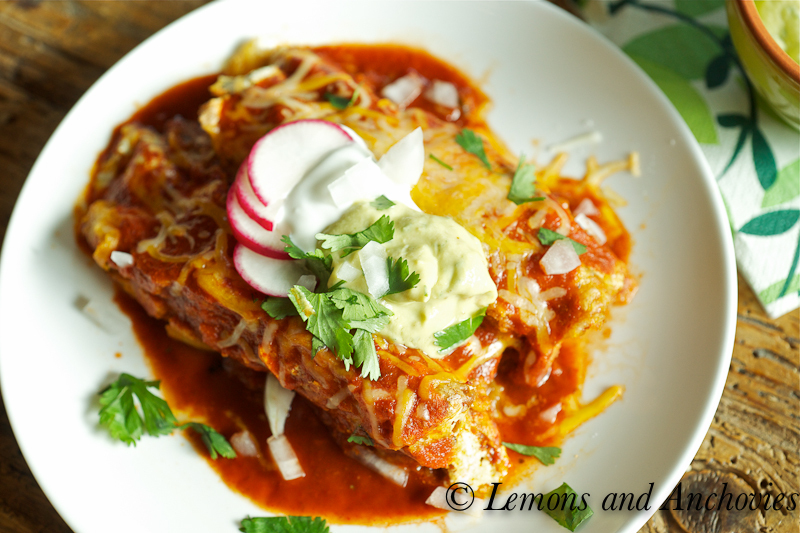 My family’s favorite enchiladas are filled with shredded chicken or turkey mixed with cream cheese and sauteed spinach. To balance the richness of the filling I only put a tiny sprinkling of queso fresco on top. Next time I’ll try adding mushrooms!